Flume Giveaway Week Starts Now! UPDATE: Grand prize has been revealed!! Head to the mural (Franklin St and Meserole Ave in Brooklyn), snap a pic of yourself in front of the wall and tweet pic with #FlumeFHS to enter to win 4 meet and greet tickets to Forest Hills 8/27, Tour Poster, 'Skin' Limited Edition LP, Rare White Label Vinyl featuring "Never Be Like You" + "Smoke & Retribution"
We're teaming up with Forest Hills Stadium to give away Flume tickets and prizes all week! All you have to do is Tweet the Flume mural pictured below with #FlumeFHS to enter! One winner will be selected each day to win a prize. Prizes will get better each day with a Special Grand Prize Friday (details on how to enter to win Grand Prize coming soon)! Check out the prize schedule below and don't miss out on Flume's upcoming show at Forest Hills Stadium on August 27th! Thursday - 2 Tix to Forest Hills 8/27 + Tour Poster + 'Skin' Limited Edition lP + Rare White Label Vinyl featuring "Never Be Like You" + "Smoke & Retribution"
Friday - Grand prize!! 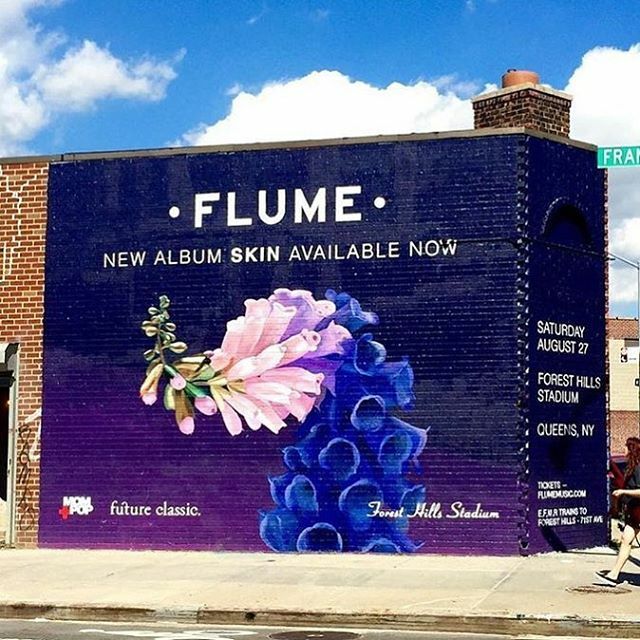 Head to the mural (Franklin St and Meserole Ave in Brooklyn), snap a pic of yourself in front of the wall and tweet pic with #FlumeFHS to enter to win 4 meet and greet tickets to Forest Hills 8/27, Tour Poster, 'Skin' Limited Edition LP, Rare White Label Vinyl featuring "Never Be Like You" + "Smoke & Retribution"